Visiting the Farm | Our Farm by Earth Flora Inc. It seems like everyone’s heading to the South this summer. We’ve been getting a number of emails asking if they could visit our flower farm this summer. If you find yourself in Cagayan de Oro, and heading out to Bukidnon to do the Zipline, then you’re surely welcome to come over and get dirty! Our flower farm is blessed with a backdrop of the Kitanglad mountain ranges, past the vast pineapple plantations of Del Monte and Camp Philips, onto picturesque little barangays (towns) strewn with simple pretty houses with small patches of flower gardens. You won’t be driving on paved roads but it’s a nice bumpy ride of dirt roads but strewn here and there with a picturesque landscape of Mt. Kitanglad. 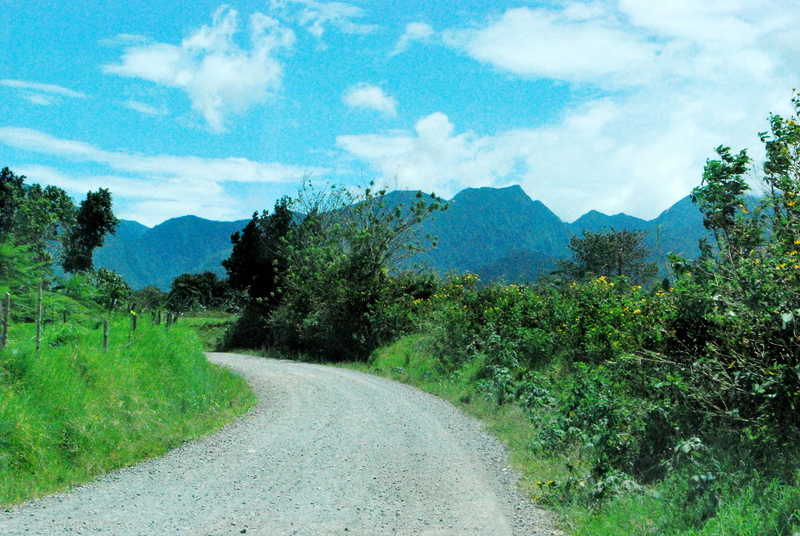 We’re on the foothills of the majestic volcano and mountain, the fourth highest in the Philippines. 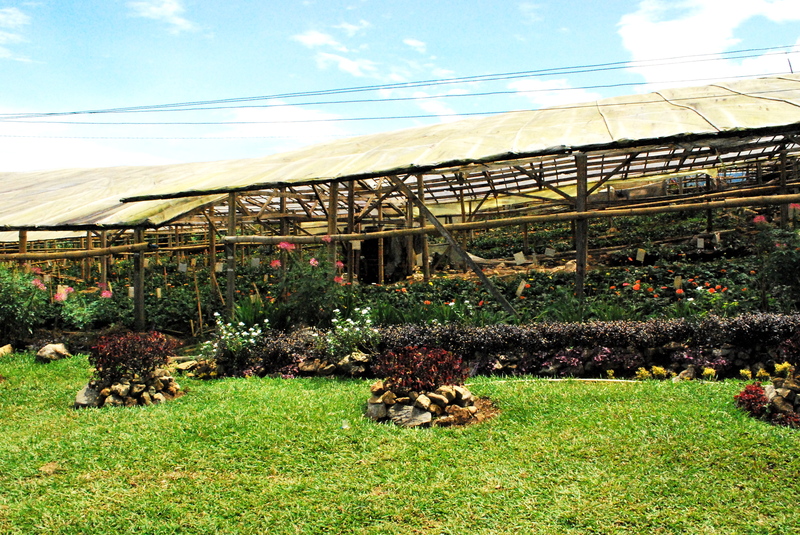 Earth Flora (that’s the name of our farm) is in Dahilayan, Manolo Fortich, nestled between Malaybalay and Sumilao. You get here by driving up to Malaybalay, 40km from Cagayan de Oro (about an hour’s drive.) Once you get to the Alae Quarantine Station, take the roundabout, and go straight up to Camp Philips. You know you’re headed up the right direction when you see an imposing landscape of never-ending pineapples and the purple majestic mountain right at the end of the seemingly endless road. Head for the mountain, we’re right at its foothills. The next landmark would be signs pointing to Mountain Pines and the Zipzone Adventure Park. Follow the signs and it will bring you directly to our flower farm. You’ll see us right before you get to the Zipzone. You’ll see bamboo poles sticking out, our rose gardens and chrysanthemums on your side of the road. We’re really not a farm resort but a working farm. So please expect to see nature at its most basic, unadorned (but we have flowers everywhere! ), crude and unfussy. We don’t have paved paths or walkways so bring boots (or shoes you can get mud on.) You will have to walk on soil, over stones and rocks, sometimes muddy. Sometimes, you’ll have to scrunch up your noses, as we compost and use fermented fish scraps for our fertilizers. To the sophisticated nose, the smell can sometimes be a wee bit nasty. The sun can be especially strong in the summer and we’re in the uplands. Use a sunblock and bring a hat. We do have some working boots and straw hats you can borrow if you’re not squeamish. And oh the bathroom: our toilets are waterless. If you’re brave enough to try doing your necessities in a handmade wooden urinal with just sawdust to catch it, then do try using our toilets. We do try to manage the smells by treating the sawdust with bacteria, and the bathroom is clean and kept clean, opens up to the sky and is airy. But I’m making a disclaimer, just in case! Instead, you’ll see a garden adorned with the wonders of nature. See the vibrancy of colors and be amazed at the wonder of seeds and plants sprouting into buds, and then blossoms. You’ll be hearing an endless cacophony of bird song. You’ll like the cool weather that brings spring to the air. Do say hello to our farm creatures big and small: the teeny ones that are our pest busters and the burly cows that help our composting. Watch our farmers chattering as they sow, plant, harvest the flowers, and bundle them up. Talk to Toto and Dadang (though Toto is the most talkative), they have a whole lot of stories to share. Sometimes, Nicolo is there too and you’ll know him by his bulky dirty boots. You can even go up the bamboo house, rest a bit. It’s quite a view. If you’re lucky, they might serve you tea or coffee. Maybe you’d like to see how our greenhouses have been built with bamboo, see how composting looks like, get a whiff of our fish emulsion, get dirty with the earthworms and see how everything in the farm makes a seamless whole. It’s always a treat for me, going to the farm. I go home with new eyes. I remember how to be a child again and everything is just filled with awe and wonder. And sometimes, I actually do hear the earth laugh in the flowers. WOW!!!! I love the flowers, when I go home to Bukidnon I want to visit this place. Hi. Our family has a plot of land in Alfonso, Cavite. We have been wanting to use it for farming but we are apprehensive because we don’t know anything about farm infrastructure and the actual farming methods. Would you be able to point us to an agency or a group that can help educate us and help set-up the farm infrastructure for us? Thank you for your email. We would be happy to help. For Biodynamic Farming, our friend Greg Kitma (who is the President of PhilBio) conducts workshops for farming, especially geared for those who want to start a farm like you. He sometimes conducts workshops in Tagaytay or in Lubang, Pampanga. I can give you his email address and you can contact him directly. Our farm is in Bukidnon and while we can also help you, it might be more expensive or impractical as your farm is here in Cavite. im planning to drop by this coming june and visit your farm. im in the organic vegetable trading business and would love to see what we can offer to our clients. Please provide me with a contact person, contact number and a short list of what you are producing like specialty vegetables. Hi RT. Thank you for your email. Yes, please do visit our farm. You can contact Nicolo directly. Email him at nicoloaberasturi@gmail.com or text him at 09177002007. 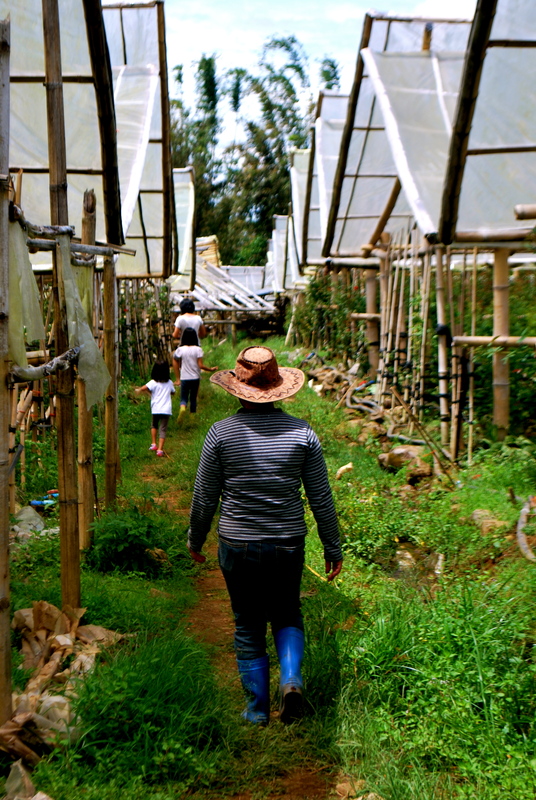 Our farm managers are Toto and Dadang, and they are usually at the farm. Nicolo is also there half of the time. It would be great if we could coordinate your visit so you can go while he is there. You can see a list of the vegetables we grow by checking out http://www.downtoearth.ph. Thanks again. Hi there…. !is your temperature there is cool??? ?I wonder that could chrysanthemums thrive well in lowlands…our location is not elevated..in Bagontaas. Our average temperature is 16-17 degrees Centigrade at night. During the day, it’s about 25-30 degrees. The farm is located at the foothills of Mt. Kitanglad, at 1200 meters above sea level. Can we purchase seedlings of chrysanthemums? Hi. We are sorry but we have a contract with our Dutch supplier not to sell their seedlings. We are only allowed to use the seedlings for our own cutflower production. I do think though, that you can buy from Busay, Cebu. Some local growers sell seedlings there. Thank you! very nice flowers! !..can we visit your place? hi!,..i’m roy,a cardiac nurse here in the k.s.a. but an agriculturist by heart(i mean florist)..i had a small backyard flower garden before going abroad.after a couple of years my flowers stopped giving good blooms that’s why i decided to go abroad to have something to feed my family.it’s been ten years now and i.m planning again to start my old hobby and small business,flower gardening…when i saw your articles.i realized how wrong i was in dealing with my plants.your article really enlightened me..thanks a lot for that!..i’m planning to visit your farm if you’ll allow me and have some ideas of your farm,..i.m only saddened that you are not selling seedlings. (i think i’m going to busay,cebu again)….some wonder whites and puto2x is enough…thanks a lot again for your website!! !more power..
Hi Roy. Thank you for the inspiration as well. Yes, you are most welcome to visit our farm. See https://flowerdepot.wordpress.com/visiting-the-farm/ and we look forward to seeing you! Hi there – The Expat Ladies Charities, Inc members will be going to Zipzone for some fun on April 14 and thought that it would be a good idea to drop by your farm and learn a thing or two about plants, composting and organic farming/gardening. Hi Marilou. Can you email us (flowers@myflowerdepot.com) or text us (09228165145) your mobile number so we can coordinate your visit? Thanks. At last, we made it to your flower farm last Saturday afternoon. The ladies were very impressed to see first hand the original source of the flowers in their “raw” form before they get into the flowershops. There was a warm welcome waiting for us from Dadang. By the time we left the farm, I think she has managed to convince (or inspire) everyone to start their own organic composting at home. Thank you very much for letting us visit your farm at short notice. hi i would like to know if accept Ojt in your farm??? Hi Steve. Yes we have accepted OJT in the past. We are working on a new program now for OJT and/or volunteers too. We will let you know. Thanks! Hi Ed. So sorry for the late reply. Our farm is in Bukidnon. We have a Farm Store in Makati. Where are you located? Are you planning to do OJT in Makati or are you in Mindanao? Good day! I would like to inquire if you accept OJTs? Hi Lennie. Are you based in CDO or Bukidnon? Hi Ed. May I know where you live? Our farm is in Bukidnon. Are you planning to apply for OJT there?